The Bulldog football team had a job to do. After bulldozing their way through their first two District 4-AAAAA matchups, there was little doubt in anyone’s mind who was destined to claim the throne. All that remained was to put an exclamation point on the 2017 regular season. The ‘Dogs knew they were in for a different look from Lovington. The Wildcats were a team with nothing to lose, and they played like it, making the first quarter a bit more interesting than some would have predicted. But when the boys in orange found their footing, there was simply no stopping them. When the cannon smoke from seven consecutive touchdown drives cleared, a fourth straight district title was in hand. And on to the playoffs. The ‘Cats were able to convert twice on fourth and long and once on third in the game’s opening series Friday at Bulldog Bowl. 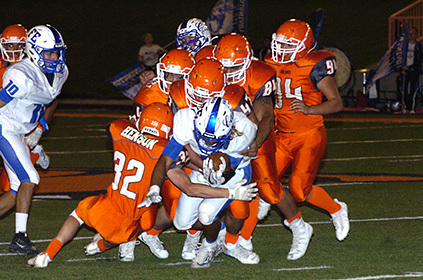 The Bulldog offense, meanwhile, punted away their first possession on a three-and-out, and once Artesia found the end zone, Lovington immediately answered. But while the Wildcats’ penchant for taking chances paid off a few times early in the contest, the scales began to tip. A first-down try on fourth and 33 from their own 26 resulted in a turnover on downs and set up the ‘Dogs’ first score, and another TOD near midfield as the second quarter began was also followed by an Artesia touchdown. 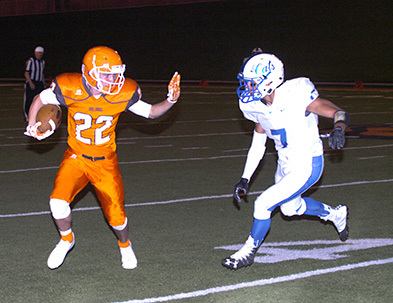 With the Orange Crush starters in the groove, two punts and one more turnover on downs deep on Lovington’s half of the field would follow, and the Artesia offense made each transition count, reeling off TD after TD en route to a 49-14 final. “We’re likely to see something along the lines of what Lovington did in the playoffs, so it was good for us to have to make some adjustments on the run,” said Henderson. “We had to get better at picking up pressure and defending the spread, and some other things we haven’t seen in quite a while. The ‘Cats tried for a third fourth-down conversion in their opening series, with sophomore quarterback Casey Perez launching a pass into the Bulldog red zone. It was picked by Kaden Chumbley, but pinned back at their own 13, the ‘Dogs couldn’t make their way out, punting to the Lovington 38. 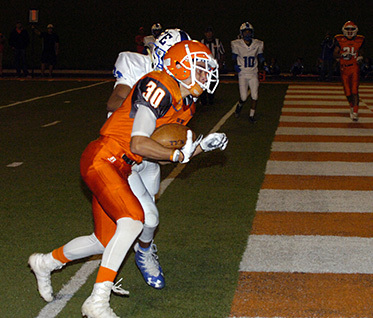 A fumble and recovery for a loss of three and a trio of incomplete passes returned the ball to Artesia at the ‘Cat 26, however, and after a five-yard Robert Fernandez run, senior quarterback Taylor Null found AJ Estrada for eight and Fernandez for the final six to put the Bulldogs on the board, 7-0, with 2:29 to go in the quarter. 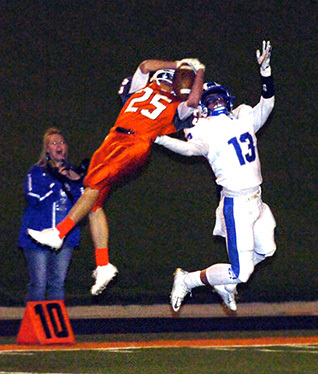 Faced with another fourth-down situation, Lovington got the pendulum swing they were hoping for just over a minute later when a desperation toss by Perez lofted over the heads of the Artesia secondary and into the arms of Isaiah Henson, who darted 73 yards to pay dirt to tie the game. Forty seconds later, however, the ‘Dogs were back in the lead, as Null followed a 13-yard pass to Estrada with a 38-yarder to Fernandez to make it 14-7 just 10 ticks away from the start of the second. The Crush would step up to force another turnover on downs to cap a clock-chewing drive by the Wildcats, and after connecting with Tyler Greenwood for 44 yards, Null turned junior RB Jagger Donaghe loose for an 18-yard touchdown run at the 6:08 mark. Lovington’s first punt of the night was of the three-and-out variety, and this time Fernandez would do the rushing duties, scoring from the 20 to put Artesia up 28-7. A quick TOD in their own red zone also proved costly for the ‘Cats, as despite a pair of holding flags, Fernandez would drag a host of defenders from the Lovington 22 to a first and goal at the nine, and from there, Null hit Donaghe with 23 seconds on the clock to set the halftime tally, 35-7. 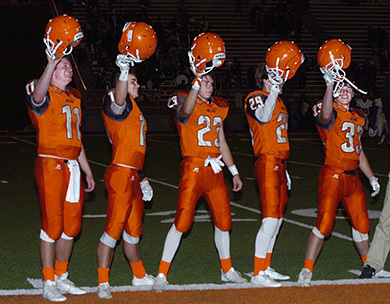 Artesia picked up where they’d left off as the second half commenced, setting the mercy-rule clock in motion with a 31-yard touchdown strike from Null to Chaney Hardt a minute-and-a-half in. They kept it moving following a Wildcat punt on another Null-to-Hardt score, this time from the 17. With the ‘Dogs’ second string once again receiving the opportunity for some valuable district playing time, Lovington was able to make their lone possession of the fourth quarter count, marching from their own 24 to a seven-yard TD pass from Perez to Jorge Carrasco to make it 49-14. Junior QB Trent Taylor then secured the first downs necessary to run out the clock, sprinkling passes to Beau Matthews, Collin Turner and Isaac Rodriguez between runs by Nathan Barrera. Artesia finished with 452 total yards of offense to Lovington’s 262, posting 146 rushing yards, largely courtesy of Fernandez, who was 9-113 with a score. Null went 14 of 22 for 265 aerial yards and five TDs, two apiece to Hardt (5-80) and Fernandez (2-44). The Wildcats managed just 21 ground yards on the night, with Perez going 23 of 40 for 221, two touchdowns, and one pick. The Crush logged one sack for a loss of four, five tackles for a loss (-14), and eight stops for no gain in the contest as Artesia closed out the regular season with a record of 8-2 and secured the No. 1 seed in this year’s Class 5A state playoff bracket. “We’re really pleased with the way we’ve played over the back half of the season,” Henderson said. “I think we played at a really high level, and we’re proud of the guys, the work they’ve put in, and how well they’ve performed. 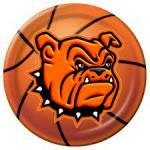 Rounding out the top four in this year’s bracket and joining the Bulldogs in receiving a first-round bye are No. 2 Belen, No. 3 Roswell High, and No. 4 Farmington. The Eagles will get the winner of No. 10 Deming vs. No. 7 Miyamura, the Coyotes the victor between No. 11 Goddard against No. 6 Aztec, and the Scorpions the result of No. 12 Capital at No. 5 Los Lunas. The ‘Dogs, meanwhile, will await the outcome of No. 9 Lovington at No. 8 St. Pius in a Nov. 17 or 18 quarterfinal game at Bulldog Bowl. “At this point, with an open date, you just go back to the basics,” said Henderson. “We have to make sure we’re doing well in a variety of areas. We’ll have an idea of who we’re working on, but it’ll be two different somebodys. That just gives you a chance, though, to work on a lot of different things and prepare for kind of the whole picture of the playoffs.